Higher education does not come free. The challenge that faces the upcoming collegiate population is the lack of state funding for public universities. In previous years, a benefit of attending a state school was lower tuition. That is not necessarily the case anymore. 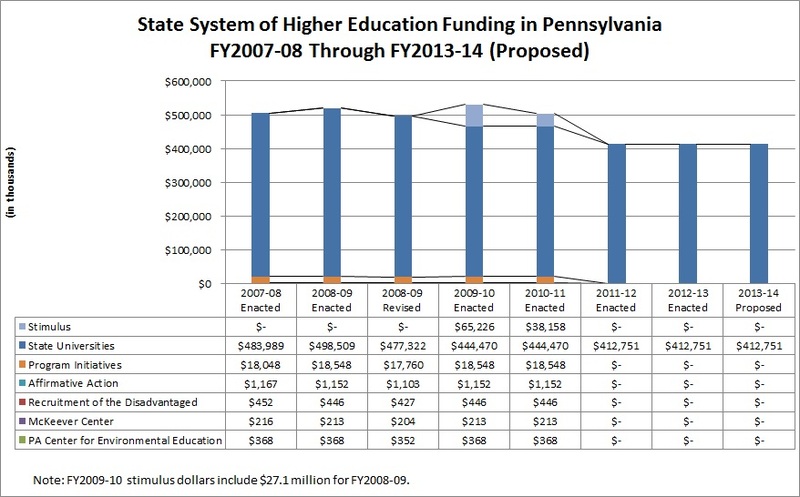 As funding remains flat, the universities in the PA state system face new challenges regarding the budget. These challenges are not only problematic for the universities, but the students who rely on a well-rounded state school for higher education. PASSHE’s funding problems are not a new issue. In the 2008-09 budget, PASSHE saw a $22 million cut in funding from the state. This cut was not obvious because of the $27.1 million of stimulus money PASSHE received. The next fiscal year, PASSHE saw a $38.2 million bump in the budget. In 2010-11 funding to PASSHE remained the same. The 14 PASSHE universities were well aware the stimulus money was going to run out but while the extra funding was there the schools used it. Everyone knew it was going to happen and in the 2011-12 budget it did. The stimulus money ran out and PASSHE saw a $90 million (or 18%) cut in funding. PASSHE had not seen such deep cuts in recent history. The 2011-12 budget was comparable to 1998-99 budget. Although there was threat of another drastic cut to the budget for the following year, funding for PASSHE has remained flat since the 18% cut. Since the 2011-12 budget cut, PASSHE universities have had to face some unique budget challenges. The 2014-15 is offering nothing to provide PA universities any relief and the consequences are becoming evident. The universities are laying off professors and freezing enrollment in some academic programs. Recruiting more students could be a possible solution. But with the 2.2% drop in enrollment last year and the reduction of professors, it is not clear if that is a viable option. As the universities accrue expenses they have to come up with a way to pay them. PASSHE Board of Governors Chairman Guido M. Pichini understands the difficulty of running a balanced budget and says these are challenges we all face. PASSHE is not seeing the funding it needs to provide the best education to its students. The best way to help is by advocating, make sure your politicians understand where you feel the money should go and if the money isn’t there it is time to get creative. Unsure of what is going to happen to PASSHE funding in the future the state and PASSHE are looking to find ways to make flat funding a little bit easier to deal with. The state’s solution includes Ready to Succeed grants to be enacted in the 2014-15 fiscal year. The $25 million program will award grants based on income and merit. These grants are intended to help all college level students in PA, regardless of the school they choose to attend. The solution some schools have come up with is secession from the PASSHE. The ring leaders Tomlison and Dinniman believe some schools could provide more to their students if they were not restricted by the state system. It does not look likely this new piece of legislature will pass but it has begun to stir the pot. Those with a stake in PASSHE; whether it be the students, the teachers, or the community, have begun to express their views loudly. You can continue to follow the conversation on Twitter at #slasshe.